Yipee! It’s Perfect Picture Book Friday. This week, I have chosen to review Mr. Prickles: A Quill-Fated Love Story. I am in love with this book. It is MOST adorable. Synopsis and a few lines: (from the book jacket) Mr. Prickles was not a particularly friendly fellow. He was tough to get close to . . . because he was a porcupine. “You’re not cute like us,” said Raccoon. “Or cuddly like us,” said Chipmunk. “Or playful like us,” said Skunk. Poor Mr. Prickles was very lonely-until the day he met Miss Pointypants. Could she be the perfect prickly companion for moonlit strolls and midnight feasts? Was love in the air for even the sharpest of sorts? Resources: These downloadable Prickly Love Notes would be great for children to view and then create their own love notes. Here is a PDF of black and white love notes that could be used a color pages. I didn’t find any other resources, but this book would lend itself well to discussions of bullying and not fitting in. Why I Like This Book: This would be especially great for Valentines Day…but I couldn’t wait eleven months to share it with all of you. No matter what day of the year, you will be happy that you read it. Clever wordplay adds humor to the familiar theme of not fitting in. After being taunted and teased by the other forest creatures, I was thrilled that Mr. Prickles noticed Miss Pointypants. It takes them a minute to warm up to each other (as they regard each other pointedly) but, as witnessed on the cover, friendship wins out. You will feel the rejection, loneliness, and love as Scott Magoon‘s illustrations brilliantly convey the emotions of the characters. I’m like a week late, but love this story and added it to my library list. Looks like the perfect age range for my son. Thanks for adding it to the list. Hi Penny, this is my first time to visit your site through Susanna’s Perfect Picture Book Friday meme. The first thing that caught me was the word-play “quill-fated love story” indeed! This sounds just like my kind of book! I have pinned this in my Pinterest board so that I’d be reminded to borrow this as well. Oh dear oh dear my stack of books to borrow has grown considerably since we have joined this meme, and it’s only the first week! Sorry it took me a bit to get back with you. I have had very limited computer time for the last couple of days. Thank you so much for stopping by. I know what you mean by the stack of books! There are so many I want to read that it could be my full time job :•) I would love that! This sounds like a really funny story…with an important message! Thank you, Penny, for bringing it to us. It’s a cute one. I read it to my great nieces & nephews yesterday. They laughed at the name Miss Pointypants. When I read the title on Susanna’s blog and then travelled here to read I kept thinking ouch!…. but, this is so cute story and so true about times when we feel we just don’t fit in…. even the prickliest find a friend. Love this! It is a sweet story with a friendly ending. I hope you get a chance to read it. I have been seeing a ton of porcupine stories lately…must be a trend! This one sounds really cute, and love the name Miss Pointypants! I will have to look for the other books on porcupines and see if I like them as much as Mr. Prickles. Thanks for stopping by my blog! What a clever book, Penny! I love the message it sends…we may be prickly on the outside but lovable underneath. I think you will like it, Erik. It has some funny lines! Great choice Penny. Sounds like a fun book with a great message for kids. Love the title and the cover. They grab you immediately! Thanks, Patricia. It is really cute. I can’t afford to buy every book that I would like to have…but I did buy this one. LOL, Sweet, sweet, funny love story. Great choice, Penny! Thanks for stopping by to read the review. You are so welcome. I am honored that you stopped by to read the review. 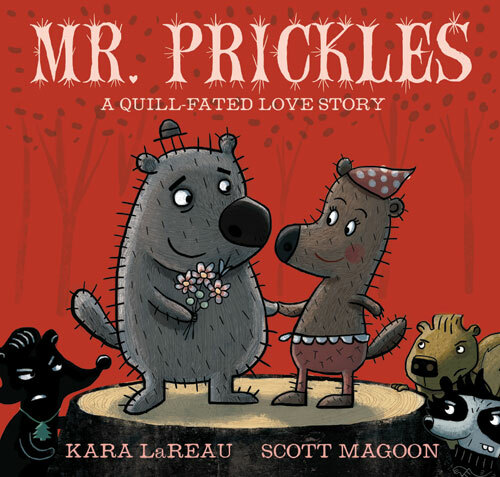 My copy of Mr. Prickles: A Quill-Fated Love Story arrived in the mail this week. Yea! Oh, this book reminds me of Porcupining: A Prickly Love Story by Lisa Wheeler (Little, Brown, and Company – 2002). Thanks for sharing. It’s refreshing to know that similar stories can still be published…so long as the market isn’t infiltrated with such, I guess. This reminds me of that old Schoolhouse Rock video The Tale of Mr. Morton.Do you remember those? He was as lonely as Mr. Prickles, but found true love in the end. That was supposed to be pointed – I loathe auto-spell! I know!!! I have been auto-corrected and auto-spelled into senseless texts and emails! So glad you like The Cow That Laid An Egg. You ought to read the others…The Cow That Was the Best Moo-ther, Best Cow in Show, and First Week At Cow School. I haven’t read the last one yet…but plan to since I loved the others.